Steve Penberthy : adventures in watercolor: Learning & Product Expo: Art! This weekend, I'm attending the Learning & Product Expo: Art! in Chicago. One of the really great things about this event is that your supplies are provided--you just show up and paint! I'll be participating in two workshops: a three-hour session titled "Don't Get Lost in the Details" taught by David R. Becker, and an all-day workshop called "The Sketchbook as an Ends, Not Just a Means" taught by Joseph Stoddard. The course description for Becker's "...Details" workshop says, "Don't be scared of crowds; some of the most beautiful paintings are city scenes containing crowds of people. Many beginning painters steer clear of this type of subject because they feel it is hard to do and too tedious for watercolor. In this hands-on workshop, you will be shown how to simplify elements and turn a hard-looking reference into something that will be surprisingly easy to paint." Sounds great! I first discovered David R. Becker by checking out his book, How to Sketch With Watercolor from my local library, and it quickly grew to be one of my favorites. Somewhere along the line, I realized that becoming competent at watercolor sketching was a key for producing original works, so the book really helped lead me to new confidences in painting. I'm looking forward to meeting Mr. Becker and getting some in-person instruction. Be sure to check out his excellent website. 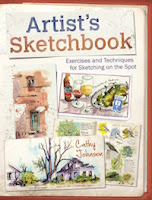 Also, along the line of sketching, is the "...Sketchbook..." workshop by Joseph Stoddard. The course description says that, "The sketchbook is traditionally thought of as a preparatory tool for the development of larger, more serious work. Stoddard suggests that the sketchbook is an art form in-and-of-itself and can stand alone as legitimate art. 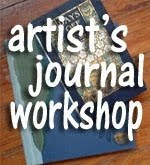 This hands-on workshop will explore the use of the sketchbook as a journaling device, a travel companion, a way to increase your painting skill on a daily basis, and a way to explore new avenues of creative expression." Wow! I wasn't aware of Mr. Stoddard until I did a little research before enrolling in this workshop, but I really liked what I saw on his website. In the Thoughts section, Mr. Stoddard offers that he prefers a raw sketch to a finished work of art. "I have always like looking at artist's sketchbooks more than their finished work...I see the sketch as the purist form of artistic expression. It is what I want to see framed beautifully and hanging on the wall in someone's den, loose and sloppy with notes in the margins and the pencil lines showing through." In addition to the workshops, I'm interested in the art supply expo and the new art-supply products that I hope to find there. I'm going to be taking photos, and I hope to do some blogging while in Chicago. At worst case, I will post some summaries of the event once I get back.